Anyone Who Has Felt the Tenderness of a Gentle Paw on Their Knee or the Tickle of Whiskers on Their Cheek Knows Why Pets are Special Creatures! Pet Memorials can be sent with or without photos by email or regular mail. Donations are not necessary but always welcome. We first met Sue when she stopped into the HEART Adoption Center wanting to volunteer. Her love of animals was soon apparent and she gladly did whatever was asked of her no matter how dirty the job. Not only did she work her own weekly shifts, but filled in for others and stopped in daily to visit with her feline family. Sue wasn’t afraid of any cat and became an excellent “scruffer” for those cats needing shots, meds or manicure. Unfortunately, she earned a few “battle scars” along the way but it never deterred her. She loved all the cats equally. Sue loved greeting visitors to the HEART Adoption Center and telling them about the residents. She especially loved children and spent extra time with them answering their questions and teaching them about the rescued animals. Sue made every animal at the Adoption Center a needlework heart with their name on it for their cage door – every time a new animal arrived Sue would show up the next day with a personalized heart – plus also donating some of her artwork for various HEART fundraisers. 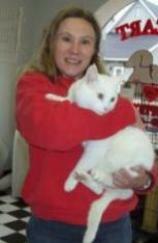 Many scared cats benefited from Sue’s kind words, gentle touch and warm lap. Sue faced many challenges but never complained or felt sorry for herself – she was more concerned in what she could do for others. She will be greatly missed by all. Never has HEART had a volunteer who loved the organization more than Kathy. Although not one of the first founders, she was one of the very first members and remained so until her death in 2011. She was the organization’s Treasurer and was also actively involved in fundraising and teaching newer volunteers about rescue. 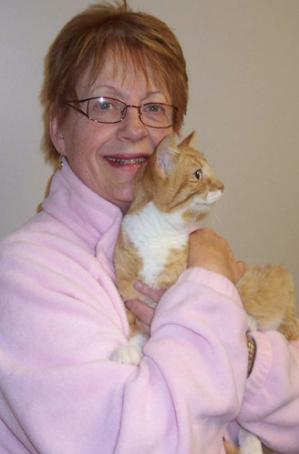 In addition to being a member of the Board for many years, she enjoyed fostering kittens. Kathy had a big and happy personality. She lit up a room when she walked into it and people were drawn to her good nature. When challenged with severe health issues she fought the good fight. To this day “Boss” Beaver, as we affectionately called her, is sadly missed by her family and volunteers.